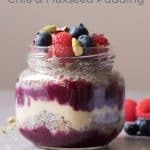 This chia and flaxseed pudding is a healthy option for a cold breakfast or snack and it’s perfect to add it to your Healthy Meal Plan. It’s suitable for any diet as it’s vegan, gluten-free and dairy-free and it can be prepared in just a few minutes. Preparing a chia and flax seed pudding is as easy as mixing 3 ingredients and letting them rest overnight. The proportions of the ingredients are 1:1:4; that is, one tablespoon of chia, one tablespoon of flaxseed and four tablespoons of milk. 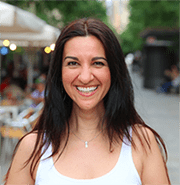 If you want to prepare double the amount, you will put two tablespoons of chia, two of flax seed and eight of milk together. 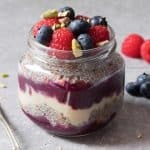 And if, in addition, you want to prepare this same pudding of chia and flax seed with jam and almond butter, as you see it in the photos, you will simply have to place the different layers in a transparent pot, possibly made of glass. Mix the chia, flax seed, and milk, and let it sit overnight in the refrigerator. Place the different layers in a pot. When a friend saw a photo of this recipe, she asked me how I had managed to get the layers to be so defined. It seems that the times she tried to create something similar, it didn’t look so nice. Make sure that the chia and flax seed pudding is compact so that the layers are separated. For this reason, I recommend that you leave it overnight in the fridge, although it would be enough for two hours for the chia and flaxseed to release their mucilage (below I explain what the mucilage is). Place the ingredients starting from the edges of the glass so you have more control of the quantities. Finally, in the preparation video of this recipe, I used oat milk, but I just wanted to let you know that any type of milk could be substituted, vegetable or animal. 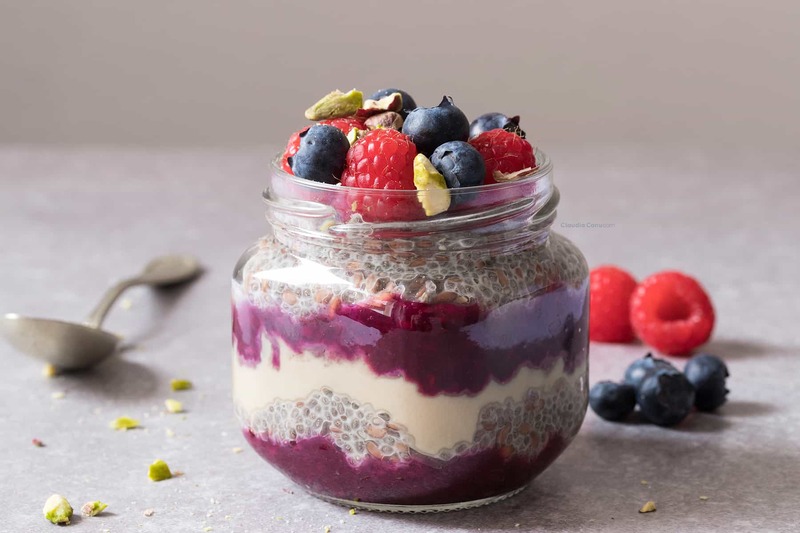 The main reason why this pudding is healthy and definitely worth introducing into your diet is that both chia seeds and flax seeds produce mucilages, a soluble fiber of a viscous nature. Helping in cases of constipation because it allows softening of the stool and facilitates its evacuation through defecation. Helping to reduce mucous membrane inflammation, which makes it ideal for treating irritations of the digestive system and is also a good remedy for a cough. Having a prebiotic effect, helping the beneficial bacteria of the organism multiply, neutralizing the harmful bacteria and improving the composition of the intestinal flora. Finally, both flax seed and chia provide Omega-3 fatty acids that are beneficial for the body. Ideally, prepare it directly in a glass jar with a lid and store it in the fridge. Keep in mind that if you prepare it on hot days, or use animal milk as an ingredient, it is essential that you keep it in the fridge. Personally, when I prepare it in the winter, and I use vegetable milk, I leave it out of the fridge so that in the morning it’s not too cold. However, if I use animal milk, I keep it in the fridge, taking it out as soon as I wake up so that it can get to an ambient temperature. A chia and flax seed pudding is stored well in the fridge for about 4 or 5 days. So, if you prefer and want to save some time, you can prepare more, store it in the fridge and you’ll have it ready for several days. If you are going to prepare this complete recipe of chia and flax seed pudding with jam and almond butter, I advise you not to keep it in the fridge for many days. It is better to leave the various ingredients of the layers separate, putting them together only on the day you are going to eat them. As I mentioned above, this recipe is ideal to start your day, but it is also a healthy snack that will keep hunger away until dinner time. And if you are one of those who usually have dessert after eating, save this recipe as a healthy option for dessert. Keep in mind that the amounts indicated are for a full breakfast or snack and that for a dessert, you should consume a lesser amount. Also, this makes the ideal breakfast or snack that you’d like to take to work. And if you are reading this post in the summer, you can prepare it in a glass jar and take it along to the beach or for a picnic. In this recipe, I used a homemade elderberry jam and almond butter for the layers, but if you prefer, you could use a hazelnut and cocoa spread or other nut butter, such as cashew nuts. You know the flavors that you prefer, so from the base of the chia and flax seed pudding, you can experiment with your favorite ingredients. Also, keep in mind that you can modify the order of the layers as you wish, so use your creativity to prepare something delicious. Do you think that you are going to try this recipe? Or do you think that someone you know will like it? 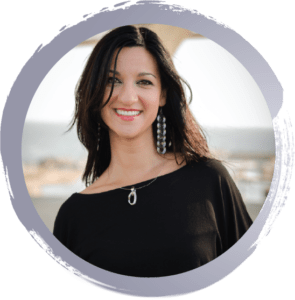 Do not hesitate to leave a comment below. You can even rate this recipe by using the star system. 1. 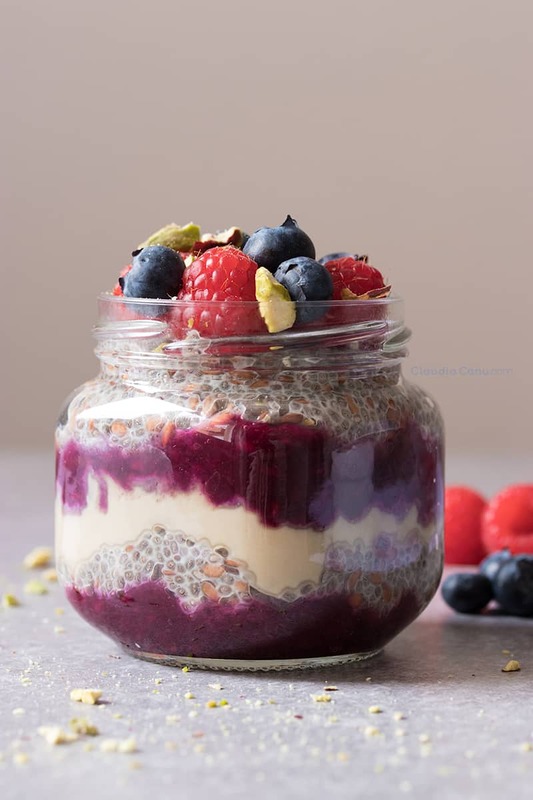 In a glass container with a lid, mix 1 tablespoon of chia, 1 tablespoon of flaxseed and 4 tablespoons of milk, stirring until all of the seeds are soaked and let it rest a minimum of two hours or overnight, in the refrigerator. 2. 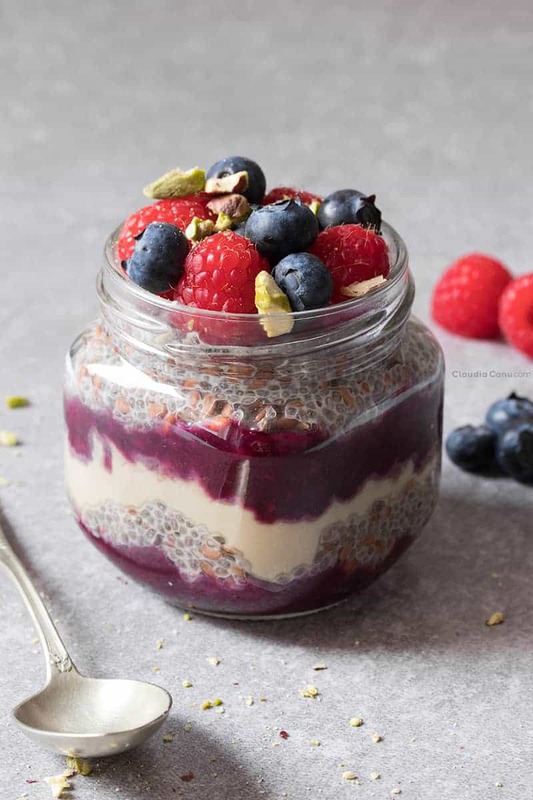 In a transparent glass jar, place 2 teaspoons of jam, continuing with 2 or 3 teaspoons of chia and flaxseed pudding, two teaspoons of almond butter, 2 teaspoons of jam, 2 or 3 teaspoons of chia pudding and flaxseed. 3. Decorate with blueberries, raspberries, and pistachios. I’ve made this recipe to impress my girlfriend and she just loved it! Can this be made with flax seed meal? If so, how much? Yes, Susanna, you can definitely use flax seed meal. You can use the same ratio 1 : 1 (1 tablespoon chia + 1 tablespoon flax seed meal) and in this case you’ll get a very dense and chewy texture. If you use a ratio 1 : 1/2 ((1 tablespoon chia + 1/2 tablespoon flax seed meal) the texture is more like the one you see in the video. Please, let me know if you try this out!